Here is our short report 'The River City 2050'. Thank you to everybody involved in this case study process and we hope to see you in the final presentations! What could the river area look like in 2050? how do you go to different places, where do you meet your friends, and how do you create your own venture? do we still have enough resources in 2050 to cover our daily needs? or most imporantly, do we have a happy life where we all consume equal opportunities of life while taking best care of our mother nature? 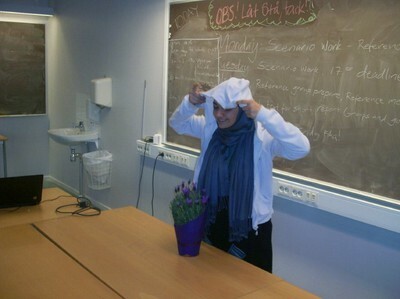 Welcome to the final presentation of the course Project management on sustainable development. We are students from different academic background who have been working on a project where we are creating scenarios for sustainable development in the river area of Gothenburg for the year 2050. 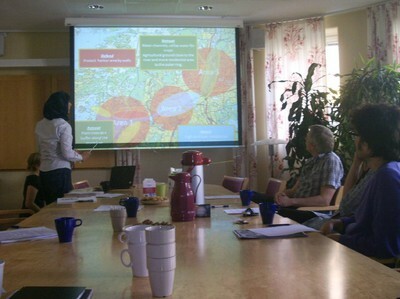 The project is a collaboration between the University of Gothenburg and Chalmers. This week has been quite different from the other ones. First of all, we gave up our 'home' at GVC for a week moving to Handels. It has also been a week of individual work since commencing our chapters for the upcomming anthology. The short report The River City 2050 is almost finished and next week the printing will start! Today, we had the traditional Fredagsfika where Anders treated all to a Strawberry R0ller cAke^ whilst Emma tried to impress with a sweet Apple Cak3^. 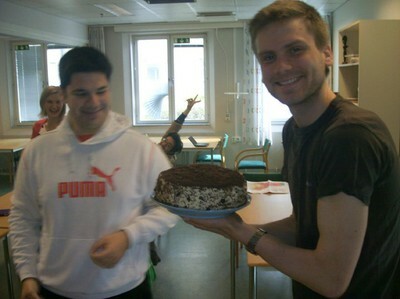 Anders' cake won the poll 2-1... The week was summed up and all seemed to be pleased with the week's work, but missed our class room and coffee maker at GVC. So next week we'll be back and the tasks of preparing for not less than three presentations during the last week will be looked into. The anthology chapters are also to be finished and put together, but with two weeks left we're confident we'll make it in style! The week we had in front of us was kind of hard and packed week since the second reference meeting was included and also the three scenarios should have been finished. As chairpersons, me and Jonas tried to make a schedule for the whole week and give the members their tasks for the entire week. From the morning meeting the reference group gathered together and discussed the structure of the meeting. They decided to have one paper with a short description of each scenario as a handout for the reference meeting. After that the whole idea were discussed in the class and then the scenario groups started their work for the whole day keeping the deadline of 5 pages of PowerPoint and also 15 bullet point for the reference meeting by the end of Tuesday. We started our meeting by celebrating Jonas Birthday. After that we explained the schedule which me and Jonas had made the day before. So by having this schedule everyone was clear with their task for the whole week. All groups started their work direct after eating a very tasty birthday cake which had been made by me J. At the end of the day all groups submitted their part for reference meeting and we decided about what other should do on Wednesday since some of us should have attend the reference meeting the other took the responsibility of revising the project aim, sustainable development definition and background and also we agreed on that each group should prepare some feedback on other scenarios. This Wednesday was kind of busy day for me. I was one of the reference group meeting and also a chairlady which I was responsible for the project and reference meeting simultaneously. The reference meeting group; Samira, Adelina, Rita, Riffat, Nining and Islam, started the work by the first minuets of the day and we didn’t have lunch either. So the reference meeting was started at 13 pm directly. The stockholders introduced themselves as well as the students. Per joined us as one of the project advisors. The meeting was held perfectly and we got a very nice idea and comments from them. After the short celebration, we discuss the feedback from the stockholders as well as the scenario groups. 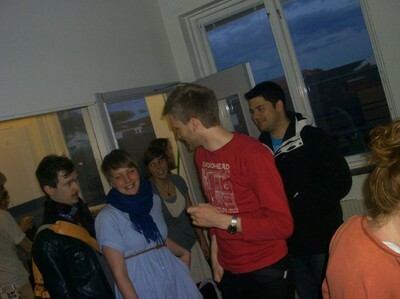 After the school we all went to Jonas place and celebrate his birthday once more. As we thought we need to change or kind of restructuring our scenarios putting stockholder’s opinion into it, me and Jonas came 8 am to school and started to brain storm the new structure for our scenarios. Per joined us 8:50 and he gave us some perfect idea which we share it later in the class. Also we discussed the editors’ task and talked about the anthology and how students should participate on that. So the scenario goal keepers gathered together and brought a good idea, then we started our work and it took the whole day. From the beginning, me and Jonas decided not to have a fika since we should have finished our 6 pages text by Monday. So from the start of the day after a very short meeting, all groups started to work hard on their scenarios. Some of them continued during the lunch as well. So by the end of the day all groups submitted their text on Gmail documents and we didn’t have fika which made me a bit sad because I was looking forward for this meeting to get feedback on my work. Any way we had a new version of fika which Jonas bought some cookies and we had kind of working fika. Personally, I thought the week was kind of productive week in which we finally started writing the short report and as I talked to some of the students, they said that finally we wrote the text for report. So for me the serious part of the course starts in this week. So good luck for the project and of course for the next week chairman who is Nam and he take the responsibility of chairman alone. Since being introduced in the Brundtland report in 1987, sustainable development has been acknowledged as one of the most important issues of our time. However, broad consensus regarding how the concept should be defined and the relation between different dimensions needed for a sustainable development is yet to be achieved. For the sake of our project, we believe that sustainable development is a process based on equity and equality, to create and hand down a society that enhances a good quality of life, in which economy is just used as a mean to accomplish this. All actions are confined on the limitations provided by ecological boundaries. This way of visioning sustainable development have guided our work with the scenarios since all three of them must meet the demands in the definition in order to be sustainable. When evaluating the scenarios, a number of conditions which contribute to a good quality of life have been considered. A long and healthy life; can be measured by the Life Expectancy rate in Human Development Index (HDI). Knowledge level; can be measured by the Education Level in HDI. A decent standard of living; can be measured by the Nutrition level, 2100 kcal/day. An equal society; can be measured by the Gini Coefficient. Good neighborhood cohesion; can be measured by quantity and quality of interaction among neighbors. For more detailed information about the sustainable development definition and the measurements of it, see the Anthology. Currently we are in the phase of scenario construction of the Gothenburg rivercity. Therefore, we invite you all for attending the reference meeting where we can discuss more about the strength, weakness, opportunities, and threats of each scenario. Thank you for your cooperation and hope to see you soon. 3. Stakeholders through reference meeting. 1. What is your connection to the river area? How do you use it? 2. What is good about the river area today? 3. Do you see any problems in the river area? 4. How would you like the area to develop in the future? 5. What are the challenges you may face in the future? 6. How is the present transport system working for your company? 7. Do you profit from the river, economically? 8. Do you see any environmental concerns in the river area? Today or in the future? In what way are you or might you be affected? - Local competence, knowledge city. Currently we are in the process of scenario construction that deal with those four aspects and also bearing in mind of the interview results.